In this image the jealous brothers Talhand and Gav battle over the kingdom of Hind. The two brothers agreed to fight on a battlefield bordered by a deep trench, which will prevent either from fleeing. Here, the opposing armies are massed on either side of the painting and the composition is dense with figures. The two princes are raised above the fray, sitting atop their elephants on golden howdahs, or seats. 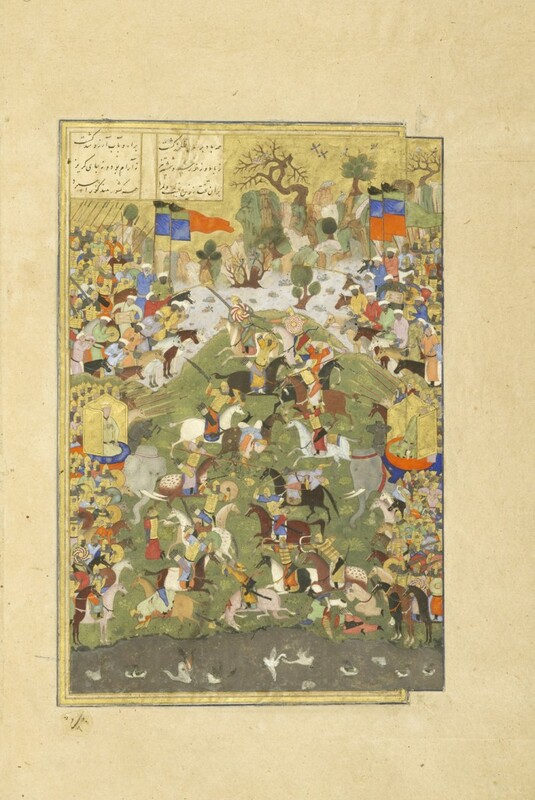 As the Shahnamah explains, Talhand looked over the enormous devastation, “gasped, and died upon his golden seat.” He can be seen on the right with his head fallen back. According to the Shahnamah, the game of chess was invented to explain this complex battle. The chess board represents the confined space of the battlefield. When a king’s way is blocked and his men have all been defeated, he dies. For various reasons, such as the crowded composition and distinct color palette, some scholars believe this illustration may be a later addition executed in Mughal India, probably around the mid-sixteenth century. In the colorful rocks near the top of the composition, one can see the playful shapes of faces and animals.